EPT Grand Final champion Rob Hollink has won the WPT Amsterdam €6,000 High Roller after beating off competition from a stellar crowd including Steve O’Dwyer Finnish pro Juha Helppi, EPT Copenhagen champion Noah Boeken and British pros Jack Salter and Tom Hall. Hollink, who won the very first EPT Grand Final back in 2005 and was inducted into the Dutch Poker Hall of Fame last November, snagged €139,000 for his victory. He now has live tournament winnings of more than $3.4m. Hollink beat the UK’s Enzo del Piero heads-up with Juha Helppi third and last year’s winner Robert Soogea fourth. 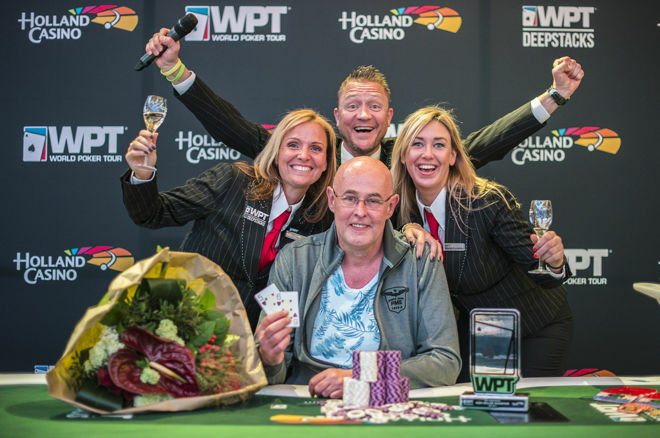 British businessman Paul Newey “min-cashed” the event in ninth place for €13,935. There were 72 entries in all creating a €398,088 prize pool. Chile’s Sebastian Ruiz is leading the €3,300 WPT Amsterdam Main Event which kicked off yesterday with 80 entries. Players can enter WPT Amsterdam up until start of play on Day 2 tomorrow so there’s still time to join in the fun. We’re the tour’s Official Travel Partner so let us help find you a great place to stay. Ruiz, who finished seventh in the giant 2,756-entry Brazil Series of Poker tournament in Sao Paulo in 2014, has 210,500. British pro Tom Hall lies in third place with 103,900 while MonteDam Swing leader Andreas Klatt is fourth on 103,500. Husband and wife duo Fabrice Soulier and Claire Renaut will also be joining the field in Day 2, with Renaut being able to claim the bragging rights (for now), bagging up 102,600 compared to her husband’s 61,900. Other notables still in the field including last year’s High Roller winner Robert Soogea (103,500), Dutch pro Michiel Brummelhuis, veteran Govert Metaal, brothers Louis and Jack Salter, PokerStars pro Felipe Ramos and WPTDeepStacks champion Thijs Menco (39,200). Day 1B starts at 2pm CET. The next WPTDeepstacks event is on the French Riviera starting May 30 when WPTDeepStacks teams up with PMU.fr for WPTDeepStacks Cannes at Le Croisette Casino Barriere.